A Long March rocket placed a Chinese-owned, European-built telecommunications satellite in orbit Tuesday to serve customers in a swath of the Asia-Pacific with television broadcasting, broadband multimedia and data transmission services. 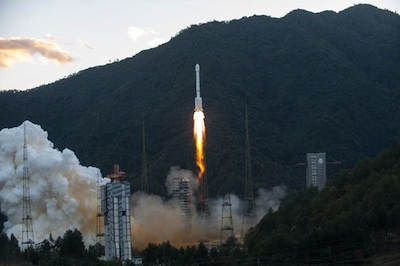 The Chinasat 12 satellite is beginning a 15-year mission for China Satellite Communications Co., China's primary operator of civil communications satellites. The firm is a state-owned subsidiary of China Aerospace Science and Technology Corp. The 11,000-pound spacecraft launched on a Long March 3B rocket at 1013 GMT (5:13 a.m. EST) from the Xichang space center, a facility in southwest China's Sichuan province. Liftoff was at 6:13 p.m. Beijing time, according to the state-run Xinhua news agency. The launch was delayed from Nov. 22 due to a technical problem with the rocket. The Long March 3B rocket, flying with an enlarged first stage and strap-on boosters, deployed Chinasat 12 in an oval-shaped transfer orbit. The spacecraft will use its own propulsion system to raise its orbit to an altitude of 22,300 miles over the equator. Chinasat 12 will be located in geostationary orbit at 87.5 degrees east longitude. Built by Thales Alenia Space of France, Chinasat 12 will reach customers in Asia, Africa, Australia and the Middle East with 24 C-band and 23 Ku-band transponders, according to China Satcom. Chinasat 12 was designed as an 'ITAR-free' version of the Thales Spacebus 4000 C2 satellite platform, avoiding the use of U.S. components to bypass U.S. government regulations restricting trade in satellite parts, preventing their launch on Chinese rockets. According to China Satcom, the new satellite will provide television broadcasting, data transmission, digital broadband multimedia and media streaming services in China and neighboring regions. SupremeSat Ltd., a Sri Lanka-based communications company, is leasing part of Chinasat 12's payload for direct-to-home broadcasting services. China Satcom took over the Chinasat 12 contract in September from APT Satellite Co. Ltd. of Hong Kong. APT ordered a backup satellite for its Apstar 7 spacecraft in 2010, but the Hong Kong operator transferred the contract to China Satcom following Apstar 7's successful launch earlier this year.